That was the beginning of a conversation that was to change the way my summer for 2008 panned out, much to the disgust of a few friends and much to the detriment of my socialising but hey looking at the summer so far, I suppose it is not a bad thing. After this conversation, I started to think about where I was in life and that I was a bit overweight: clinically obese according to my doctors. At that time I was training about 10 km a week and the nurse didn’t quite know how to break the news to me about the above fact. I was also suffering from lower back trouble and it was really annoying me, thanks to the desk job!!!!! I am the sort of person who cannot just go to the gym so I figured that if I wanted to tone up a bit and strengthen my body in general, this might be a good plan. The other reason I am doing this is the fact that I will be able to raise some money for the desperate people of a country that has been torn apart by a dictator. With unemployment at about 90% and life expectancy in the mid-thirties, the country has gone from being one of the fastest growing economies in Africa in the 1990s, to having the highest inflation of any country in the world, currently sitting at 1 400 000%. From breadbasket to basket case all in the space of 10 short years. This country is Zimbabwe, some of you might know it, some might have even had the privilege to have been there on holiday. For me it is the most amazing country in the world. A country that afforded me so much whilst I was growing up, a country I still call home and a country my heart bleeds for. It is a privilege for me to be able to try and make a difference, in any small way possible to the people, especially the old age pensioners whose pension probably equates to no more than a few pence a month, and that is for the few who actually have or had a pension. This last weekend I was down in Dover to put a line under all this Channel Swimming stuff for this year. We went down on The Saturday and had a dinner at Cullins yard on the Saturday evening follwed by a trip to the White Horse pub where it is traditional for successful Channel swimmers to sign their names on the pub walls. If you are ever in the area I would recommend going and having a look at the pub as it is quite amazing to see and entire pub with writing on most of the walls and ceilings of past channel swimmers. This was followed on Sunday by a Swim for the brave in the sea, I must admit I wimped out on this one as the weather was foul and I was sporting a bit of a cold. Below is a summary of the years events as a wrap up to this summer. All in all that is about £6000 raised from someones silly idea to swim the English Channel. Well you may ask "what now?". Well I am still thinking about doing the Channel again and probably both ways this time but that will be at least 3 years down the line. My immediate future is uncertain as I will most likely leave my job shortly. This will give me the opportunity to take some time offf and figure out where too from Now. With regards to small challenges that I am planning, next year may be a big one as A friend and I are contemplating a marathon in Africa, I am probably the worlds worst runner and have never run a marathon or even come close before but a year ago I had never swum the channel either. Kayak across the channel, cycle down Britain and 4 rounds of golf in a day. So it may turn out that you will be hearing from me again either doing all of the above of or at least some of them. I will carry on my swimming as that seems to be the one thing that I am not bad at and there are a few people that I would like to help get across the English Channel next season but I feel that to keep me motivated I need a goal. Well it has been the most amazing summer and I have learnt a lot about myself and my friends, family and people in general. Everyone wants to do their bit for charity and if I can become a vessel that lets people do thier bit I am glad to be of assistance. The response from people that I know and have met this year has been a truly amazing insight into the Human race. Finally, after many months of training in Dover and the pool and Heron lake my date arrived on the 28th September 2008. 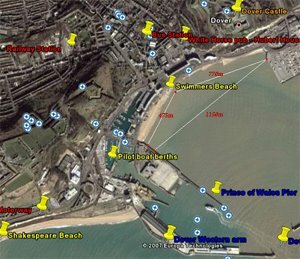 I went down to Dover on the Saturday for my last training swim with the General in the Harbour, there were about 5 of us on the beach and I went in for a 2 hour swim. After that we met up with some friends and I went off to get some sleep as I was to meet my Pilot at her boat at 0900Hrs on Sunday. This was a futile attempt as I could not sleep. Woke at 5.30 Sunday morning after a very restless night, went onto the promenade to gaze over my goal for the day and watch the sun Rise. During the next couple of Hours some more friends arrived to see me off. I boarded the boat with my parents, Mama and Papa Hippo, Pygmy hippo and A friend, Greg Woods who swam the channel 2 weeks earlier and has been a training partner for me whilst in Dover. We waved goodbye to all my supporters and they made their way to Samphire Hoe beach where I was to start my swim from. We arrived there, I jumped off the boat and went to shore to where my friends were and then off I went followed shortly by A friend, who stripped down to his smalls follwed me for a few metres shouting don't worry Graeme I will save you but gave up when he realised that it was actually quite cold and he couldn't keep up with me. 11 hours and 45 minutes later, in the dark I approached Cap Gris Nez and ended up having to clamber over some rocks at the base of the cliff under the lighthouse in the pitch Dark. All in all very satifying, my body now aches all over and I am sure it will be like this for a couple of days but I will keep the pain to remind me not to do something so silly again----------at least for a while. There will soon be photos galore and a more in detail write up. For now I would like to Thanks all my Friends, Family, colleagues and channel swimmers who helped with this attempt without them none of what I am feeling now would be possible, I didn't swim the Channel, We all did in our own seperate ways. Thank you for all your support over this venture but the Zimhippo has now had a conversation with his pilot and it now looks as if I will be swimming to France this Sunday 27th of September starting at about 8 am. Foar anyone who would like to come and see me off on the day, we will most likely be leaving from Shakespeare beach, you can get to this by heading out of dover towards London on the A20 and then at the last roundabout before you get onto the motorway, leaving dover, turn Right and then travel alosn that road and you will come to a busstop where you can park and then there will be a walkway under the highway to the beach. Just a quick update to let you know ow things are going. Well the week of my scheduled swim has arrived and I am now sitting around the house driving my parents crazy waiting for the weather to be good enough to head out for a swim. I spoke to my pilot yesterday and she was saying there was not much hope befroe about midweek and that there was still a relay team to get out before me so it looks like I will be on Friday or Saturday or Sunday. I am quite glad actually as I went training in the lakes 2 weeks ago and ended up getting a cold which I am glad to say I am now over but still holding on to a erksome cough so hopefully that will go before I swim. I am still doing some light training and will be up until I swim across. For all those who wanted to be part of this swim, there may be an chance as I may end up going on the weekend. Stay well and I will try and update this as soon as I know more. I sadly do not have internet at home as my router died so I have to make use of anyones wireless that I can get hold of. Well time is closing in to when I finally get to swim across to France. I would lke to thank all of you for your continued support in this mad adventure of mine. This last weekend I was down in Dover for what will possibly be my last big training session of the summer before I swim. My parents arrive tomorros and i will be sending some time with them. I am off to Italy for a few days with the family, Got to start the carbo loading and where better to do it than in the Pasta country of the world. Sadly my wife will be unable to join me, someone has to work to pay for this insane challenge and I love her for all her support that she has given me over the last couple of months. The bank manager might think otherwise but hey, you only live once. "okay, get out now, you up for swimming the channel tomorrow?" know that I was off. hours I had really pushed it in pretty horrendous weather. to swim knowing that I was not 100% mentally, physically and emotionally prepared. 5 - I wanted to swim on my terms, giving myself the best chance of success. The outcome - Another 2 hours of training with my mind in Limbo asking, HAVE I MADE THE RIGHT DECISION? it was 2 hours of mental torture. I will now be swimming sometime in the week of the 21st of September, probably early in the week as Alison (my pilot) will try and push people through. All my family will be with me, My parents, brother and wife will be ready to support me on the boat along wth one of My swimming coaches and some others. Well they will be on the boat at least, whether they are supporting me or throwing up over the side is yet to be seen, if they are throwing up they better make sure it is on the other side of the boat to where I am swimming. I should be alright as I will be in the water. there is a link on this website where you can follow my progress via GPS, click on the link on this page and then select Roco (Alison) this will take you to another website where you can see where the boat is in the channel. If all is going according to plan, I hopefully will be not to far away from the boat. All that remains now is for all of us to PRAY that there is no wind on that day and the tides are not too strong and the sun is out. I probably have more chance of winning the euromillions but hey miracles do happen!! Back again. Apologies for not posting for the last two weeks but life has been a bit hectic this last couple of weeks. My training is going well, over the bank holidy weekend I was down in Dover and I did a 6 hour swim on Saturday and then a 4 hour on Sunday before the weather turned horrible and the heavens opened. The PygmyHippo joined me for the last hour or so on Sunday.I was very pleased to see some of my mates that had decided that it would be a good idea to come camping in the area and spend some time with me, Thanks to all who came down, it was great to see you and spend some time with you all. The week was spent doing a few 1 -2 hour swims in the pool and, Saturday I was up at 5 o'clock in the morning to head off for Heron lake where they were having a 3.8 km race in the lake, I thought it might be good to go and pit my swimming skills against all these triathletes who need flotation aids to swim. Well I only managed to get a third place out of about 30 people who started but I could have pushed it a lot harder as I did not really want to kill myself at the beginning and my time was pretty slow, 3.8 km in 1 hour and 8 minutes, I would expect to do that distance in less than an hour in those sort of conditions. The PygmyHippo (Spencer) did it in a time of 1 hour and 24 minutes.All in all a good swim. Saturday I was fundraising again and managed to get some money but was lucky enough to get my cause out to loads of poeple so hopefully it will have been a worthwhile weekend. With regards to my swim date I am assuming that I will be swimming in my booked slot which is somewhere between the 21st and the 27th of September. I am however on standby in the meantime so if the weather is good and a slot becomes available I will swim earlier. Thank you to all the peole who have expressed an interest in coming down and seeing me off and also driving over to france to be there when I hopefully set foot on France, I will endeavor to let everyone know when I swim as soon as I know a more definite date. Sailing which took me onto sail in three world championships. Horse riding as my primary sport in my former years. After school I took up triathlons and cycling. I sold a couple of horses to afford my first bike and competed in the All Africa games in the U19 category for triathlons. It was only thanks to my swimming and the fact that I was above average on the bike that got me thus far as I was, and probably still am, the worlds worst runner. Under the watchful eye of the EnglishChannel Queen- Alison Streeter. When it comes to training, I have noticed that, for endurance sport there are many varied opinions on how to go about this aspect of your Channel Challenge so What i am putting down here is purely what I have dsigned for myself and may not in any way constitute a full training programme for you. Firstly if you are training in a pool, you will probably be pushing fairly lengthy swims so counting lengths can be extremely tedious and, if you are like me, you will lose count after about 6 lengths. To get around this a watch is essential and knowing what you can do certain distances is also essential. These times are not swimming at my fastest possible speed, these are based on what I feel is sustainable for log training. I will generally train between 5000m - 8000m each session and I do this 4 times a week and then do long open water swims on the weekends.